What is the Orbit of a Satellite? Most people think of satellites as flying east-west, circling the globe above the equator. Many do fly in such low equatorial orbits, but polar-orbiting satellites travel a north-south path across the poles. 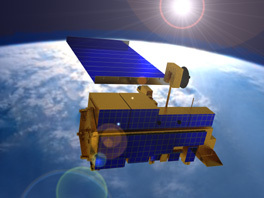 Sun-Synchronous Satellites Observation of the ground is improved if the surface always is illuminated at the same Sun angle when viewed from the satellite. Many weather, resource and reconnaissance satellites are in so-called Sun-synchronous polar orbits. Stationary satellites, on the other hand, orbit at altitudes around 22,300 miles. Back in 1945, science-fiction author Arthur C. Clarke imagined communications satellites in stationary orbits where they would travel around the world at the same speed the globe is spinning, making them hang stationary over one spot on Earth's surface. Transfer Orbit A satellite on its way to stationary orbit is fired to a special equatorial orbit known as a geostationary transfer orbit (GTO). In this highly-elliptical orbit, the satellite swings out 22,300 miles and back in to an altitude of 100 miles above Earth. At an assigned time and place, a "kick motor" attached to the satellite pushes it on out to a circular orbit at 22,300 miles altitude. The stationary-orbit region of space is referred to as the Clarke Belt. Satellites there are said to be synchronous, geostationary or geosynchronous. Clarke Belt Scores of communications and weather satellites, operated by many countries and international organizations, occupy positions assigned to every nation in the Clarke Belt. Many popular television satellites, sending programs to backyard dish antennas, are in stationary orbits. The U.S. communications satellite Syncom-3 was the first launched successfully to stationary orbit. Other well-known ones have included Inmarsat and TDRS. While many satellites fly east-west, circling the globe above the equator in equatorial orbits, many others fly in polar orbits, traveling a north-south path across the poles.